at Pages springs hatchery in Page Springs, Arizona. 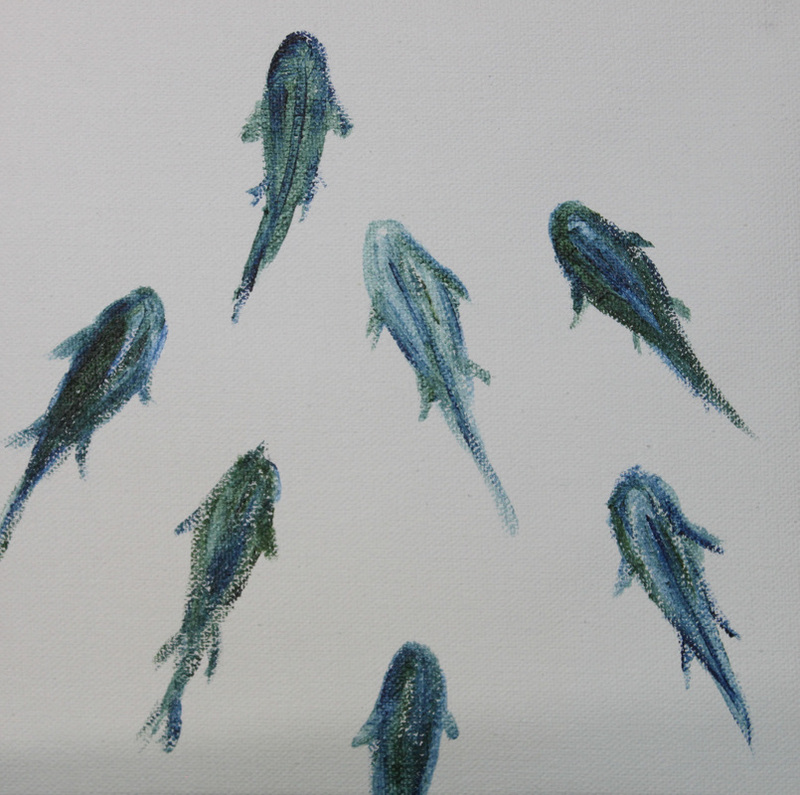 Fish typically form schools when they are scared. At the fish hatchery, the fish are raised in large cement pools. When you stand at the edge of the pools, they begin to form schools in fear but do not swim away. The unison, rhythm and movement is incredible to watch despite the reason of their action. 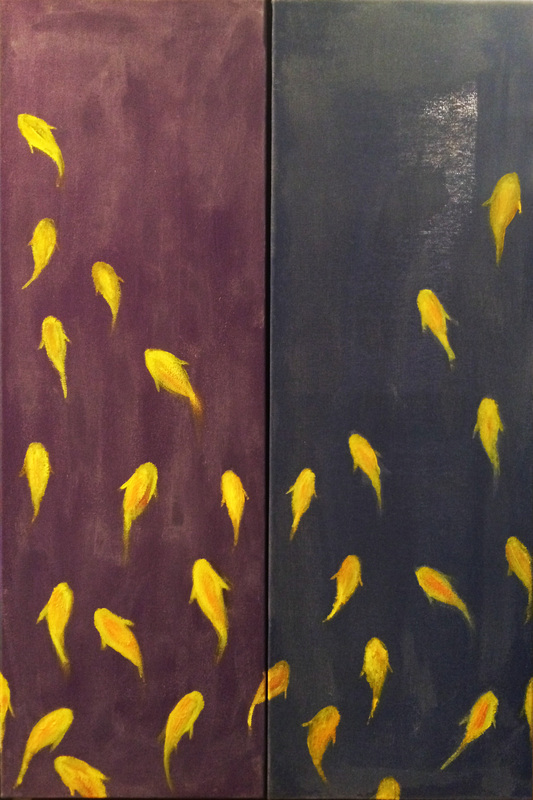 These paintings were inspired by watching the fish come together and swim in an infinity rhythm. 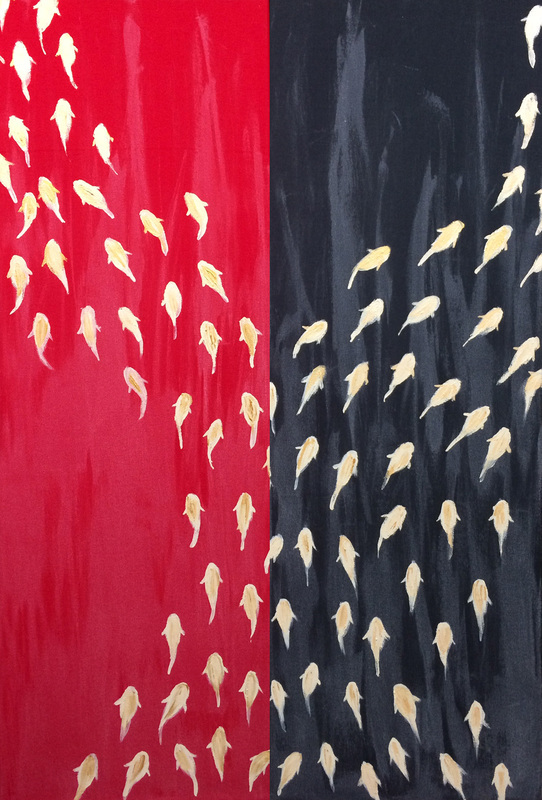 These paintings also explore the behaviors of river fish and how their habitats have changed based on recent environment changes. Increase water temperature from climate change, or lack of water due to changes in weather patterns, has effected fish population in Arizona's rivers. Most fish in Arizona are now raised in fish hatcheries not only because of environmental factors causing harm to their natural habitat but also due to societal impact from land use surrounding the water shed areas over the last 100 years. Un Banc De Poissons. 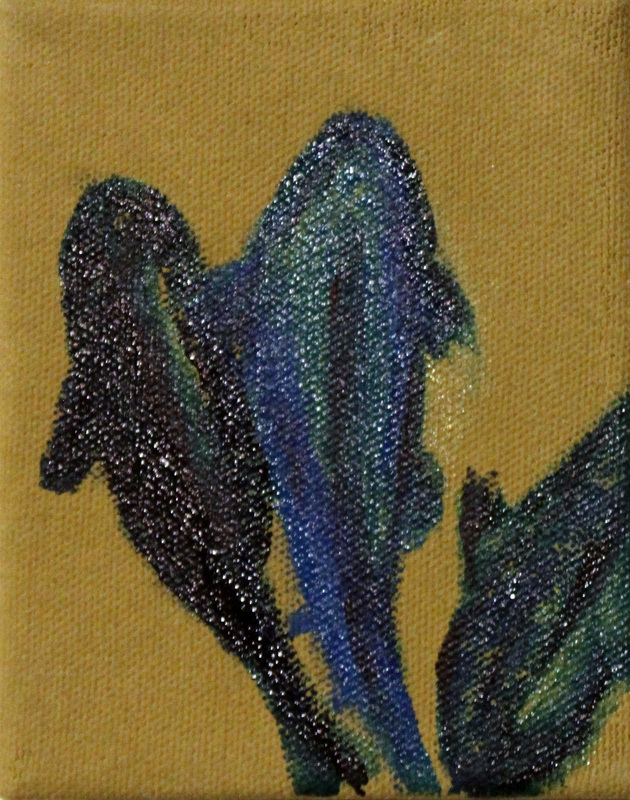 Acrylic on Green canvas. 10x10" Sold. 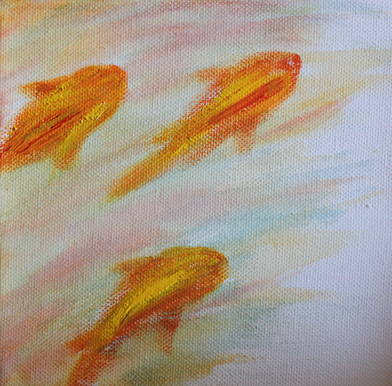 Three river fish. 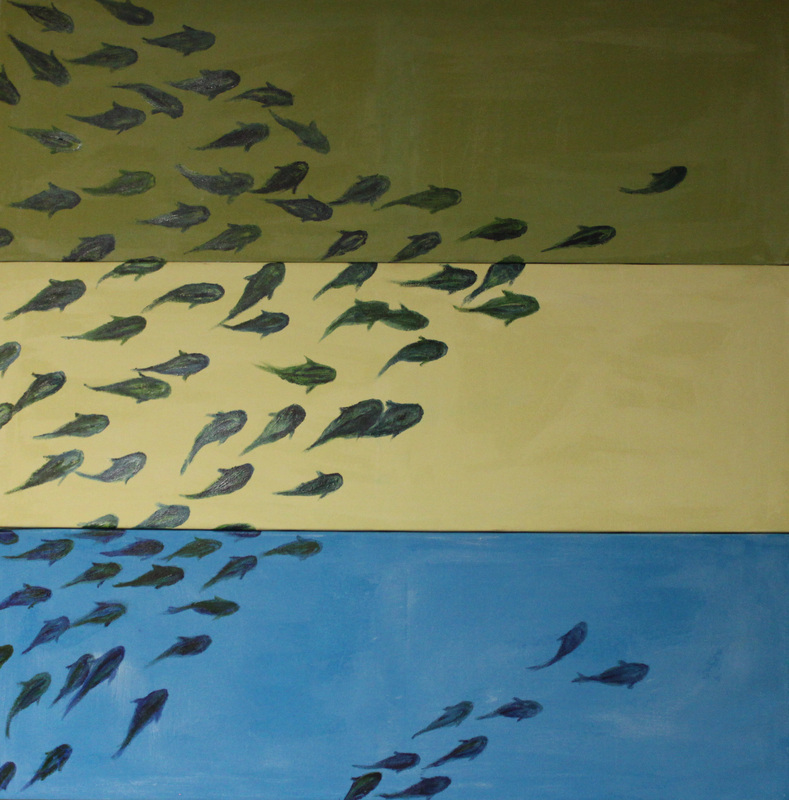 Acrylic on green canvas. 6x6"
Orange Fish. 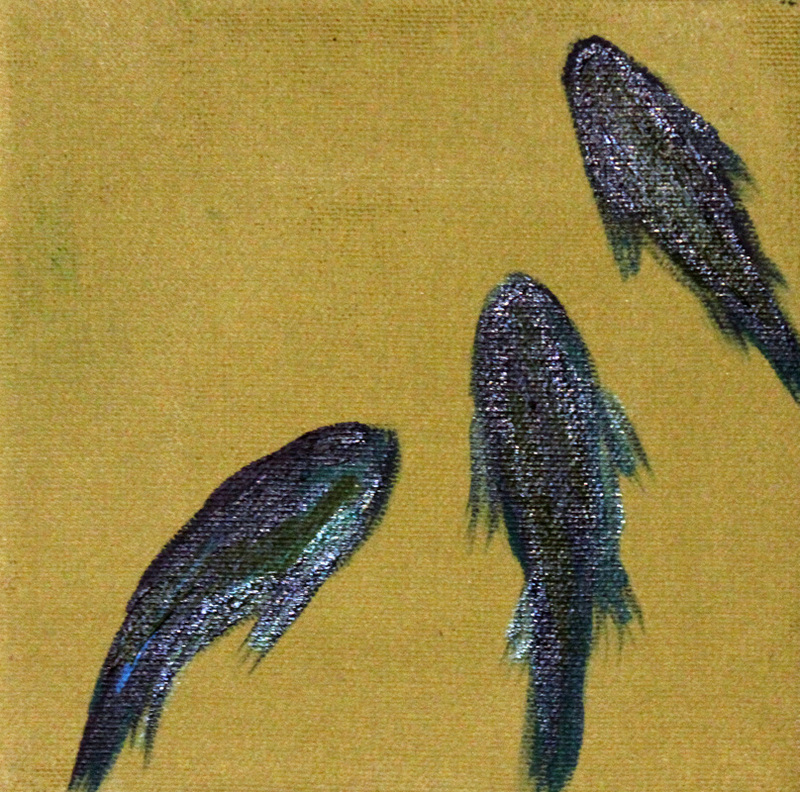 6x6" acrylic on canvas. 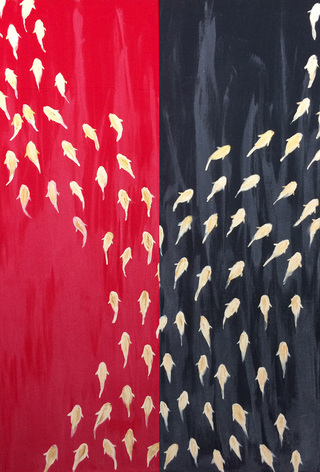 "Scatter" 2014. Acrylic on gessoed canvas. 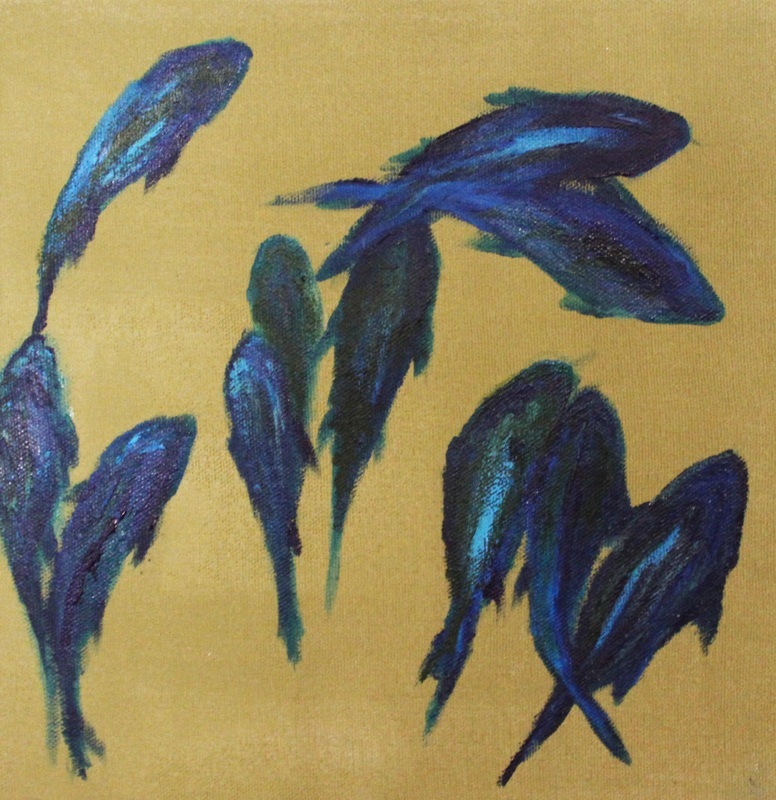 8x8"
Swim together. Acrylic on canvas. 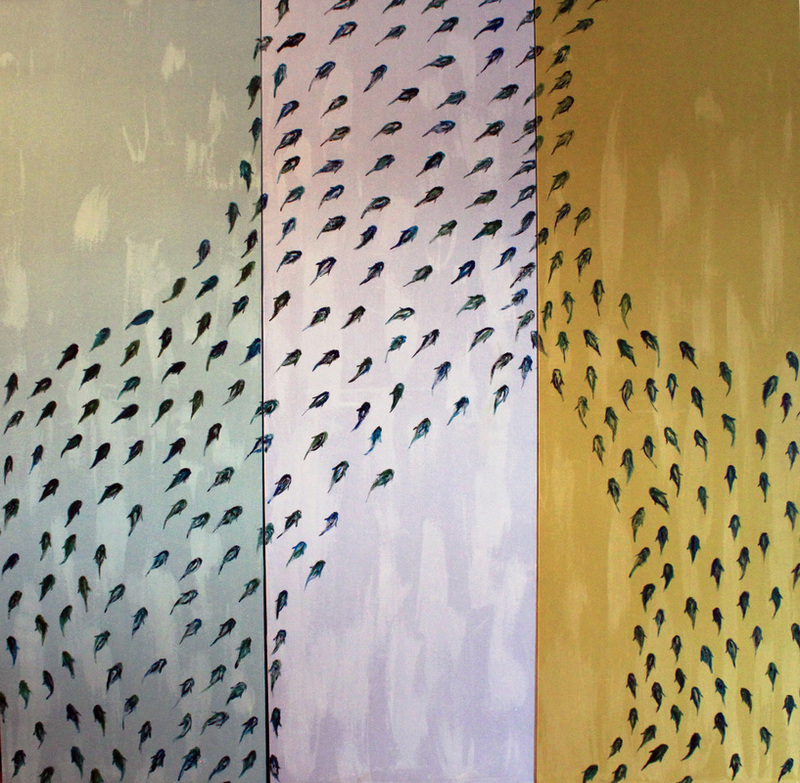 Triptych: 3 panels each 20x60"
Swimming Along. acrylic on canvas. 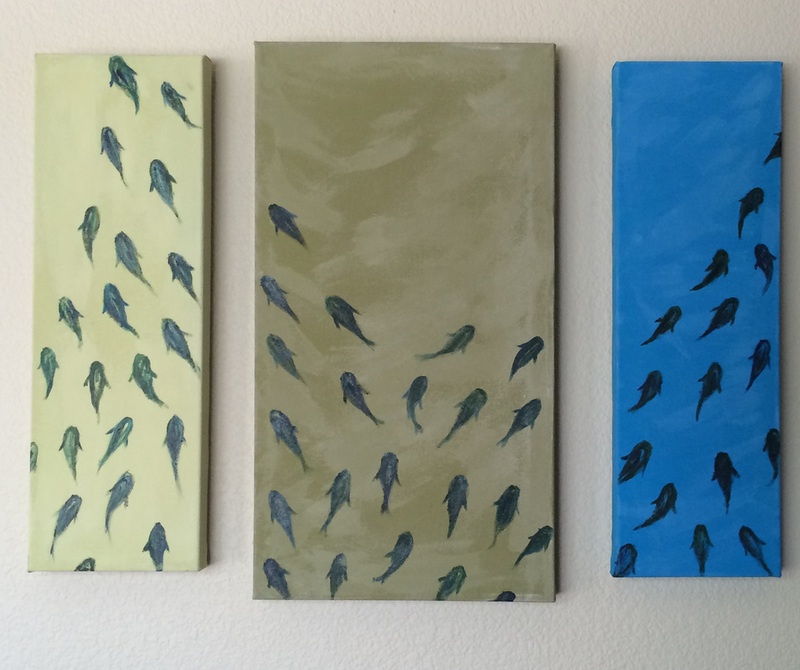 Triptych. 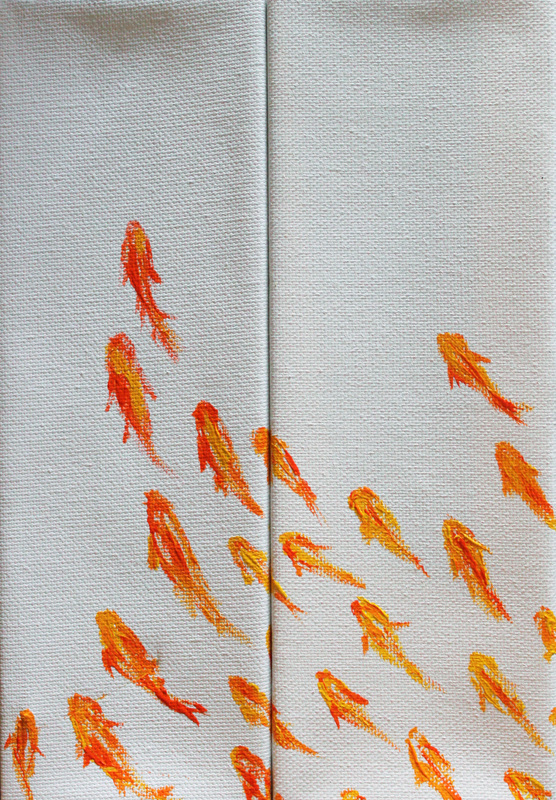 Fish Current. acrylic on canvas. 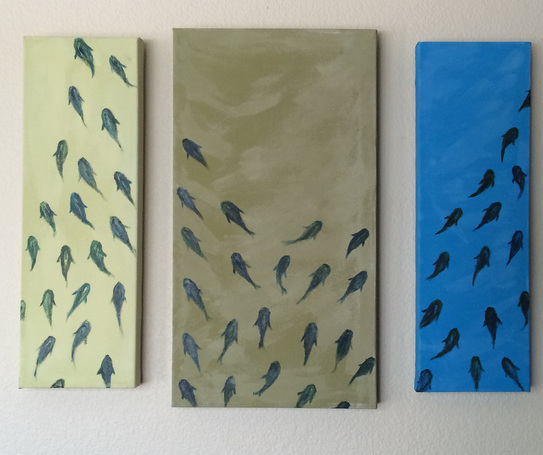 3 panels: 16x8" 20x16" and 16x8"
Like the fish paintings? 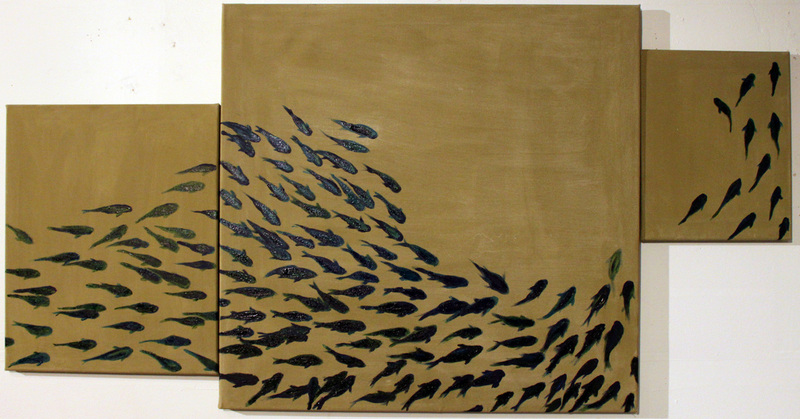 Commission your favorite colored fish on your favorite colored canvas! Find out more here.